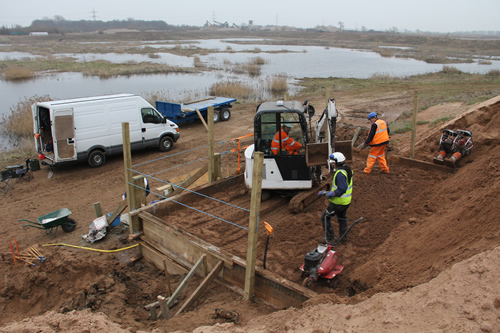 In April the Sand In Your Eye team went down to an emerging RSPB (Royal Society for the Protection of Birds) Reed Bed Reserve at Langford Lowfields in Newark to build an artificial sand bank for a colony of Sand Martins. 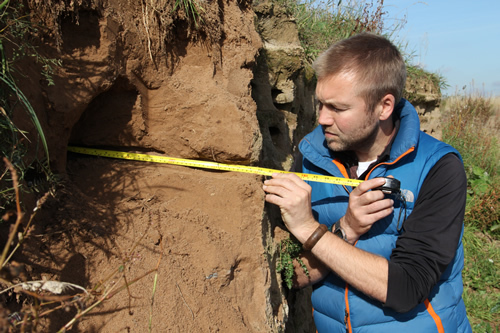 This is an amazing place of re-birth as the reserve is restored from a Tarmac sand and gravel extraction site where they have to tear up the earth to remove the minerals. 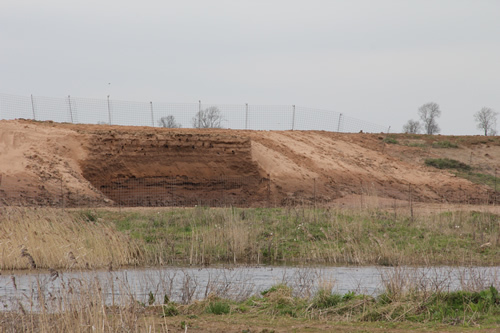 However, Tarmac works in partnership with the RSPB to regenerate the land and make what was a vast expanse of nothing into an unbelievable wetland Reserve. 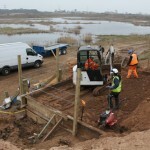 I am fortunate enough to have seen the RSPB led by Michael Copleston and many hard working volunteers create this wonderful oasis for animals and birds that is a result of meticulous planning and engineering with a good measure of help from mother nature and the River Trent which floods the site. 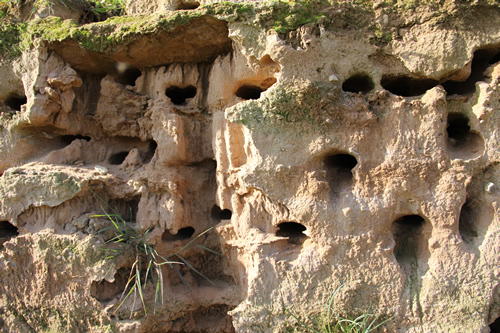 Our task was to add a little magic by making potential homes for the Sand Martins (Riparia riparia) with the waste sand from the quarry that is left over after extraction. 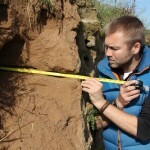 This was no easy task on such an exposed site and with sand that was not really made for sand compaction as it has little clay. 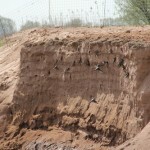 However, after four days of construction with 130 tonnes of sand we together managed to create a sand bank nestled into a hillock with a view over the water. 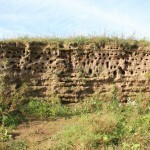 It was built according to all Sand Martin specifications with a vertical face two meters high so that most predators such as stoats and weasels cannot get to them. 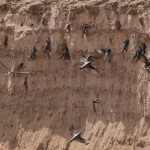 It is even designed to be slightly concave as the birds like to watch each other to see who is home and away, and take every opportunity to breed with their neighbours given the chance. What more could you want? Sandinyoureye constructing the sand bank with Mark and Paul Afford on the digger. 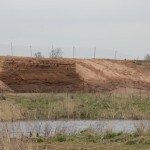 Notice the still active Tarmac quarry on the horizon with the new wetland created by the RSPB in the foreground. 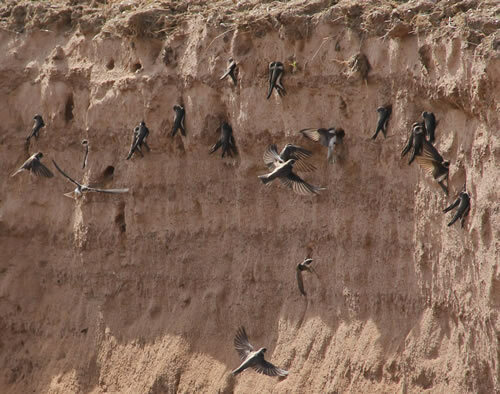 Two weeks later and we had our first residents as pairs of these acrobatic marvels flocked to the artificial sand bank and made their nests. 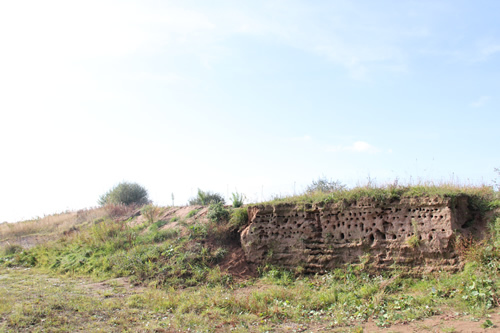 I went back to the site to take a look and it is a wonderful thing to see a flock of birds all chattering and getting excited about their new homes that I and my colleagues helped to build. 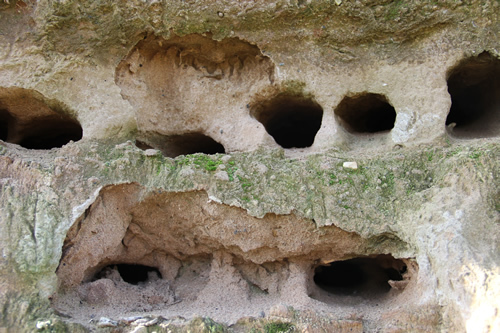 This was rather poignant for me as I was often greeted by these little birds when I first learned to make sand sculptures in Portugal. 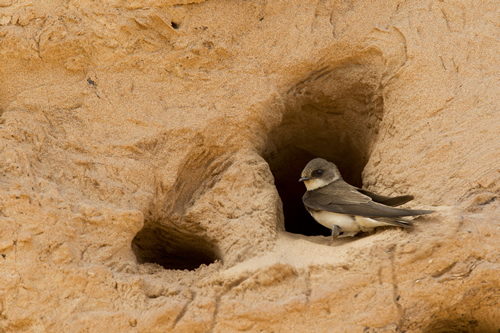 The first Sand Martins made nests three weeks after construction. 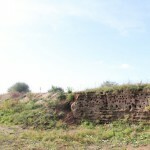 It’s autumn now and I visited last week to see how the bank was and it now looks absolutely amazing. 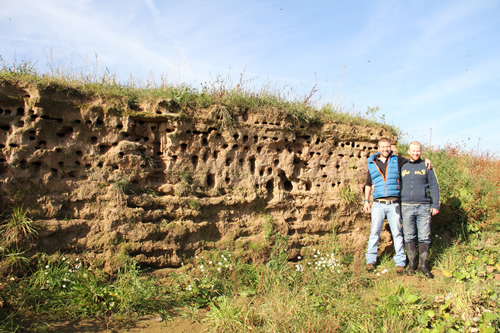 There was in the end 150 nests in our 6 meter bank and it has now been sculpted by mother nature and adorned with wild grasses and plants. 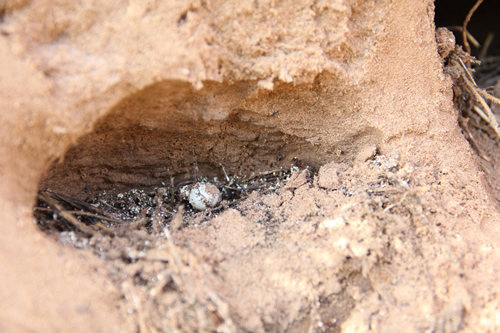 We excavated one nest and found that the birds make a narrow tunnel with a slight incline that is about 30 to 80cm deep with a small oval chamber at the back in which the birds make their nests with grasses and then rear their young. 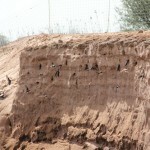 Michael also showed me the Sand Martin fleas, there are three types, two of which are endemic to the Sand Martin. 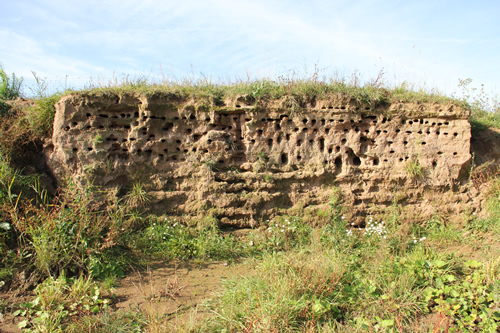 For this reason the birds prefer to excavate fresh nests each year which is why we designed the bank so that it can be cut back by the volunteers so a new face is exposed for next spring. 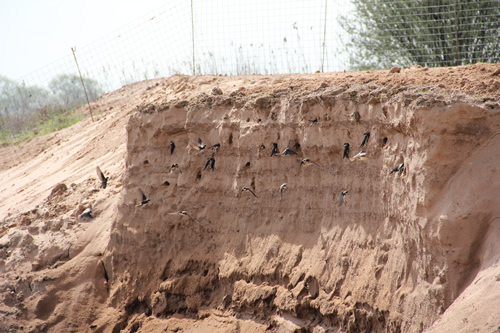 The project has been heralded by RSPB ecologists as one of the best Artificial Sand Martin Banks in existence and there are now plans to extend the bank next year so that even more Sand Martins can enjoy new holiday homes for the breeding season. 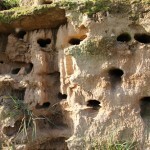 We also have designs to make a sculpture that the birds will live in. 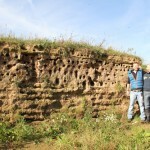 I must offer many thanks to The SITA Trust for funding the project, Mark and Paul Afford for their engineering expertise and ‘soft digger touch’, Andy Moss and James Haigh from the Sandinyoureye team and the vision of Michael Copleston for having the confidence to make this happen. 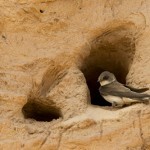 May many more Sand Martins enjoy their new homes year after year. 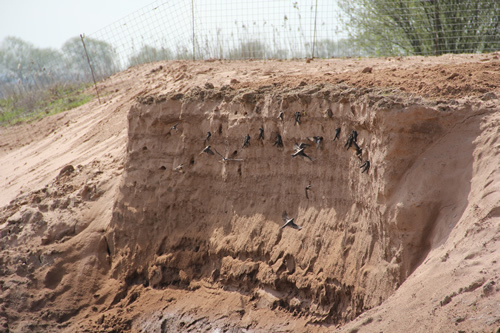 The Sand Bank in October 2012 showing the 150 nests. Note how in only in 6 months the construction has been covered in grasses. 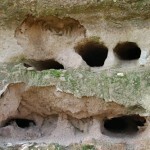 Aye, it was a great one to do and wonderful to see the birds nesting in it. 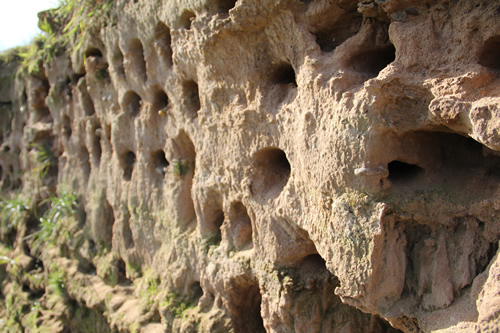 In a couple of years we have plans to make a sculpture that the birds live in. 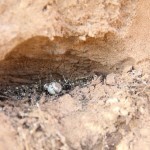 That will be lovely! What a fabulous and inspiring idea! 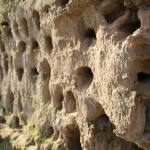 And a great reclamation project!